[LAS VEGAS—September 17, 2015] — This month Mobile Simple is releasing a new upgrade of its ABreez mobile minibar management solution that simplifies and optimizes minibar and in-room amenities operations. The mobile app communicates via the cloud with the ABreez Management System and posts charges on the guest's folio via a property-management system interface. Based on customer feedback, the award-winning, in-demand solution now features full inventory management (in rooms and multi-storeroom locations), an instant messaging/chat tool for back-end-to-back-end and back-end-to-mobile communications, and an automated email report-generation tool that enables managers to schedule the frequency (daily, weekly, monthly) and the type of report they want to receive on the day they want to receive it in their inboxes. "Today's ABreez is designed to improve effectiveness and efficiency, lead to better accuracy, increase service delivery and boost guest satisfaction," said Christelle Pigeat, Mobile Simple CEO. "The enhanced solution still manages ALL in-room operations (from minibars and snack trays to bottled water, branded gifts and other amenities). . . there still is no hardware to buy and nothing to display in the guestroom -- other than your existing refrigerator, legacy minibar, snack tray, or amenities drawer . . . F&B managers can still be up and running within 24 hours . . . and we still offer ABreez FREE as a 30 day trial. What's new about ABreez is the addition of three major functionalities that are lacking in other solutions on the market." Increase efficiency and productivity -- By keeping track of all products in the minibar and in-room amenities department, managers can eliminate the labor-intensive hassle of doing manual inventory recounts to make sure their records are accurate. Turn inventory quickly -- Ensure that in-room products aren’t spoiling, becoming obsolete or sucking up working capital. Determine exactly how much inventory is actually needed. This makes it easier to prevent product shortages and keep just enough inventory on hand without having too much. Lead to accurate planning -- A good inventory management tool will enable hoteliers to stay ahead of the demand curve, keep the right types of products on hand, and plan ahead for seasonal changes. Ensure cost cutting -- Save money that could otherwise be wasted on slow-moving products. Keep customers coming back -- To ensure that your customers are coming back for your products and services, you need to meet customer demand quickly. Have the right products on-hand as soon as your customers need them. "The ABreez inventory management tool enables hoteliers to determine in real time exactly what they have on the shelves and the dollar amount of that inventory per item per room," Pigeat said. "The same intelligence is available for each inventory storeroom. In addition, an alert will appear whenever insufficient inventory is under the pre-set minimum quantity.."
Before ABreez, managing guest requests and providing personalized service to VIPs was challenging. Today, however, the new instant messaging tool contained within ABreez is making mobile communications between staff and departments a snap. "Hotels asked us for a tool that could address urgent in-room minibar/amenity requests," Pigeat said. "Our new IM/Chat tool not only increases staff efficiency, but it boosts guest satisfaction. Here's how . . ."
At check-in, a guest requests that all alcoholic beverages be removed from the minibar. Thanks to the instant messaging tool, the in-room service manager will be able to notify the room attendant assigned to the specific guest's room instantly by s a notification on his/her mobile device that a new message has arrived. By simply clicking on the envelope icon, the guest request is been received. The attendant then immediately goes to the room, removes the alcohol, then notifies the in-room service manager via instant message that the request has been accommodated and the guest can then proceed to the room. A guest requests a room change at check in. This guest is a VIP and a welcome amenity was already sent to the original room. 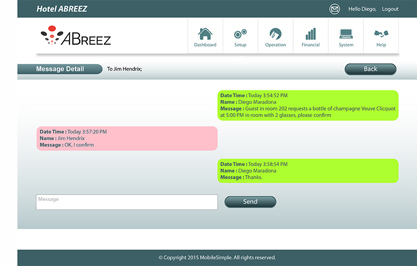 From ABreez back end, an instant message is sent to ABreez mobile requesting that the VIP welcome amenity be removed from the original room and send to the new room number. A guest is checking out at the front desk and doesn’t recall what he or she has consumed from the minibar. An instant message is sent to the room attendant assigned to that room and requests that the minibar be inventoried so that charges can be posted immediately to the guest's folio. "With ABreez, we designed a solution that not only streamlines minibar and in-room amenities operations but it greatly improves guest satisfaction," Pigeat said. "This instant-messaging tool will enable minibar attendants to immediately heighten guest service levels by either fulfilling requests in a timely fashion or by checking consumption upon request to ensure proper charge posting. Instant messaging also improves staff service levels by sending requests via mobile device to the relevant department or attendant. Speed of service is key to customer happiness." ABreez now enables managers to schedule the frequency and the type of report they want to receive automatically via email. This not only increase visibility of how well the minibar department is performing, but it provides detailed and accurate business intelligence to help managers make better decisions. To try ABreez by Mobile Simple FREE for 30 days, click HERE. Or, call Mobile Simple today at +1 800-467-5892 to schedule a live demo. "We strongly believe that mobile technology is revolutionizing the way hoteliers are doing business," Pigeat said. "Mobile Simple is committed to improving the functionality of ABreez to continually offer the most complete solution at the fingertips of hotel employees; only then are enabling hoteliers to work more efficiently while exceeding the level of service provided to hotel guests. We believe that once F&B Managers experience the solution and see a live demo, they will understand the immediate value that ABreez delivers, from real time room status to operational and financial reports, inventory updates and more." Click to view the ABreez VIDEO.